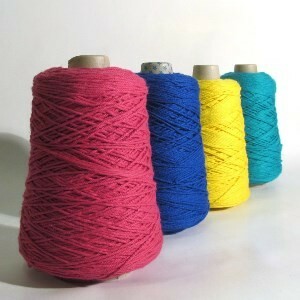 250g cones of pure soft cotton Double Knitting (4/4cc) in a wide range of colours. Double Top is a gorgeous 4ply pure soft cotton in a wide range of colours. It is spun for us and dyed to our specific colour scheme including lots of bright, rich shades as well as dark, subtle shades that you tend not to find very often in cotton yarns. 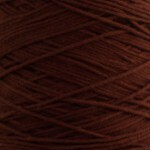 (Good Fortune is the 4ply version of this yarn in the same colour scheme, but half the thickness). Buying on a cone is the most economical way to buy our cotton and perfect for large projects such as warping and machine knitting. Guaranteed to be the same dyelot throughout and no knots (or at least not as many as there would be with multiple balls). 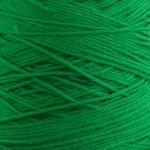 It is perfect for knitting by hand or on a chunky machine or crocheting to DK patterns, but it's also a great all round craft yarn being excellent for weaving and knotting crafts as it has a soft, but strong handle. Soft, matt cotton such as Good Fortune is highly absorbent making it excellent for turning into colourful tea towels, dishcloths, wash cloths, bathmats or placemats (whether knitted, crocheted or woven). The white and ecru options can be dyed to your own colour palette with cold water dyes and these neutral shades are also used in the technique of candlewicking. Bright, zingy colours that you won't find anywhere else. Three convenient package sizes to allow you to purchase just the right amount. A versatile product with (mostly) repeatable shades.